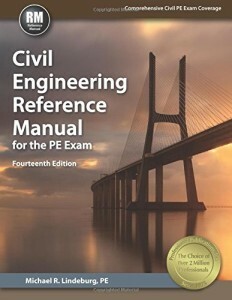 The Civil Engineering Reference Manual for the PE Exam by Michael Lindeburg (CERM) is the most often recommended review book for the PE exam. Nearly everyone that passes has a copy. The content of the CERM is unsurpassed. It contains content for both the breadth and depth options of all of the topics covered on the PE exam, and then some. There are some example problems mingled in the sections but this is primarily a reference, not a source of solved examples. In addition to covering the topics themselves there is a glossary of general engineering terms near the end which helped me on a few of the "gimme" problems. The CERM Extremely usable. It is easy to find what you are looking for through a combination of the contents in the front, the index in the back, and the shaded regions on the side of the book that separate each major section. The only downside to the CERM is its size and content. I passed the exam, using the CERM, and probably read/used 10% of its content (I did have several other resources also). You must only study the sections that are pertinent to your exam choice! As a friend put it to me bluntly when I was asking his advice on the test: "Buy the CERM". It WILL be of help to you both while studying and during the test. My recommendation is you read the majority of your depth sections and skim the breadth sections to become familiar with them. Be wary of over-reading this reference! It is somewhat expensive however this is entirely offset by it's usefulness. And it is even more offset by the fact that after passing you can resell it for close to what you paid or keep it as a great reference at the office. A Dictionary of Civil, Water Resources & Environmental Engineering was released in January 2013 and I recommend all PE exam takers get it! There WILL be around 5 questions on your exam that are absolute freebies, as long as you understand the jargon they are using. It is next to impossible to prepare for every engineering word they could potentially throw at you, so you NEED to bring some dictionary resources. I wish I had brought an engineering dictionary with me to the exam, but did not think to and did not know that any existed. 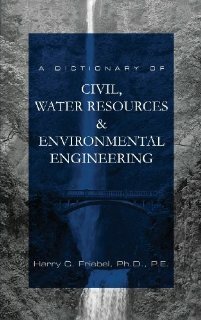 A Dictionary of Civil, Water Resources & Environmental Engineering is a perfect fit for most people taking the test. The title infers that it covers general civil, with some emphasis on water and environmental. This is mostly true, and probably for the better as water and environmental tend to have more conceptual problems that are easy to solve as long as you can understand the jargon that they use. It will without a doubt be helpful in the morning session, and will likely provide some insight in your depth session as well. I took the Geotechnical afternoon component and would have benefited from confirming some of the words that appear in the questions, such as: varve, lacustrine, and piezometric. You may argue that the CERM contains a dictionary in the back. That is true, it does! But the definitions in the CERM are not as straightforward as these, and it can be unwieldy to navigate to the glossary of the CERM in the middle of the test due to its size. The dictionary has a larger number of terms, and has very straight to the point definitions whereas some of the CERM definitions are cryptic. Do yourself a favor and get it! The engineering exams have had a recent price-overhaul (especially in California) to cope with all of the budget issues that have spawned due to the mehconomy. Be prepared to pay. Overall, the exam prices have gone up, a lot! Check out the Fee Matrix. Beginning with the April 2013 exam the total cost for a first-time taker to apply and take the Civil Engineering exams is $807.6! Engineer's that took the exams in 2010 and 2011 paid less than half that. Not all of the exams are this expensive, but all of them have had increases. According to this thread at Engineerboards.com, this is the actual cost of administering the exams. Apparently the state of California was subsidizing them previously (Why on earth were they doing that?). I like that they are no longer subsizing the exams (and I think most people applying for the test can afford it), but I completely disagree with the abrupt change and the lack of information about it beforehand. I think they should have been more open about the actual costs of the exam and had a public plan in place to keep up with the costs instead of the drastic changes. Inspired by this post from a financial analyst, I wanted to share a day in the life of a Civil Engineer. I waited to do this until I had a bad day (this one is actually just one of the longest, not really bad). I want to contrast it to the financial analyst, their day is extremely long, and frustrating. They make 2x what a Civil Engineer makes right out of college but I'm just not sure that 18 hour days 6 days a week is worth it... most of my days are very peaceful in comparison. 6:35 kiss wife goodbye, grab some frozen burritos for lunch later, grab the laptop for use on the train ride and head out the door. 7:00 on the train, study time, often this is sleep time. 8:05 start on first task of the day, a continuation of the one from the end of the day yesterday. I am preparing some cross section views in AutoCad at eight different locations at railroad tracks. I am using a template of a rail cross section section from some design standards as a starting point for all of these. We haven't done a formal survey yet so most of my information comes off the track schematics, google earth, and design submittals from other consultants. Two other engineers will go and verify my drawings in the field later so that they are correct and we have more info. It's always good to gather what information you can up front. 8:30 while working on the eight profiles I am also helping a newer engineer next to me prepare project budgets for the 21 rail projects that we are managing. It's the time of the month where we have to update ALL of the budgets with any new information that has trickled in from the other consultants that are doing the designs. The newer guy is ripping through them at a pretty good pace, I just answer his questions as he goes. 11:00 I finish up the track profiles and email them off to the other two guys working on the task. They are in our other office and it is a nice change to collaborate on a project with them. They will review after lunch. Working on schedules with the newer guy for now. 11:20 I get a call from one of the other engineers. He would like me to research Directional boring equipment to bore underneath track at the locations I just did cross sections for. I don't know a thing about directional boring but I accept and start on it. I watch some drilling videos on youtube to get an idea of what is involved. 12:00 quick lunch, I microwave a burrito and have a penaut butter and honey sandwich with a ginger ale. I eat outside so I get some sun on my face. 12:20 back to the research, reading up on some brands and types of directional drills now and their locations of vendors in the area. Turns out Vermeer and Ditch Witch are the two big brands. I give a Ditch Witch salesman a call to find out some specifics about some of their machines. 1:15 I have finished up my research. I typed out some constraints on drilling depth and direction as well as how much space a drill will need to reach a certain depth and angle. I voiced some concerns about meeting those space requirements at our crossings. I also looked into the bore diameter, we need to place 4" piping so the drill had better be able to handle that. They all can. I also list out ten or so models that could be likely candidates for us. Given our space requirements I stick to smaller models. 1:45 I assist the newer engineer with project budgets for a little longer and then head in with him to a mid-level engineer's office to discuss the budgets. We have to present the budgets to our client tomorrow, and discuss their status so there will be lots of review before the day is done. 2:39 Just got out of the mid-level engineer's office. It was not THAT much of a fruitful meeting, got held up on the first project estimate we dove into and it didn't really go anywhere. I received a call mid meeting and cancelled it. I called them back after. 2:40 Also missed an email and a call from the engineers I am working with in the other office. They want changes on the profile drawings for tomorrow. I also need to finish schedule and budget work for our clients tomorrow... getting a little strapped for time. Calling them back now. 2:45 Call was good, their deadline was pushed back a day so that leaves time for me to work on project management stuff. The guys in the other office mentioned that the mid-level engineer was freaking out that I was working on the other office's work too much even though I did let everyone know about it beforehand (people get very personnel-needy in offices). 3:00 I commit to work on project management the rest of the day today and then I can resume helping the other office's work tomorrow from 9 am to 2 pm to get them up to speed. Before 9 is when we present our updated schedules and budgets and at 2:00 is a construction kick-off meeting for one of our rail projects. Need to email both of my "managers" to let them know my schedule and keep the peace. 3:09 Emailed the peace offering and checked out an "Excel Trick" the newer guy learned. He combined a formula and custom text into the same cell with some nifty commands. Yay geekout. 3:10 back to schedules and budgets. It can be a huge amount of work to track down updated information through emails, various reports, word of mouth from the project managers, and our own staff. 4:41 still working away on schedules. Preparing an updated summary sheet of schedules and costs for 15 of the projects that are grouped together because they are funded in-part by the same local funding source. 6:40 just now wrapping up the budgets and estimates for tomorrow morning. This is the longest I have ever had to stay at work aside from the time we were being interviewed as a company for a new contract with our main client. 7:08 I catch the train home and whip out some study material for the PE Exam. 8:35 We try to get our empty propane tank filled at a gas station near In-N-Out but get shot down due to it being dark. He must have thought we would gang up on him or something? 9:00 Back home for the evening. I shower and we watch some old TV shows on Netflix (Frasier and X-Files are awesome) and my wife and I chat. This is drastically calm compared to the Financial Analyst's day... For me it would be tough to be in an office being a gopher for as long as them. Civil Engineering may be boring, but it is very stable, not that taxing, and you still make very decent money out of school, about 40k-65k depending on the area. I guess the problem here is that it is too stable and regular and slightly un-motivating. Anyone have any inspiring words about their days?